Home › Electronics › Anker Powerline+ Micro Usb (6Ft) The Premium Fastest Most Durable Cable [Kevl..
Anker Powerline+ Micro Usb (6Ft) The Premium Fastest Most Durable Cable [Kevl..
Incredibly Strong: Premium design with double-braided nylon exterior and toughened kevlar fiber core. Laser-welded connectors ensure PowerLine+ has superior toughness from end-to-end. 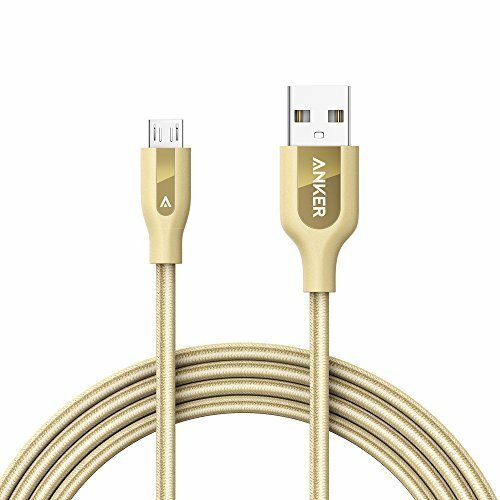 Color: Golden PowerLine+ Micro USB The Premium Heavy-Duty Charging Cable From ANKER, America's Leading USB Charging Brand Faster and safer charging with our advanced technology 10 million+ happy users and counting Unrivaled Durability PowerLine+ is the last cable you'll ever need. Proven to last at least 5 timesas long as other cables and boasts a bend tolerance 10 times higher! There'ssimply no other cable with this level of durability. End-to-End Strength Exceptional tensile strength is provided by a kevlar fiber core, double nylon-braiding and precision laser welding. PowerLine+ is built to withstand anyyanking, twisting, stretching, or dropping that it might possibly be subjectedto. Customise Cable Length Includes an innovative felt pouch which allows you to adjust cable length forany situation. Close to your wall charger? Wind up PowerLine+ inside the pouchto avoid cables trailing across the floor. High-Speed Charging Low quality charging cables can reduce charging speeds by over 40%. PowerLine+is designed with a thick wire gauge which reduces resistance and ensuresmaximum charging speed. World Famous Warranty At Anker, we believe in our products. That's why we back them all with an18-month warranty and provide friendly, easy-to-reach support.